Welcome back to our annual positional power rankings, which Dave Cameron kicked off this morning with his introductory post. You’re probably familiar with these rankings and series of posts, but if you’re a first-timer, we endeavor to take you through the projected strength of each position in the majors by team — ranking each club from No. 1 to 30 — based upon FanGraphs WAR forecasts. We also provide commentary that hopefully provides some invaluable insights and light-hearted moments. We begin with the catching position. As you can see in the chart above, the Giants, perhaps unsurprisingly, again pace the field in WAR thanks to Buster Posey. And that advantage is not insignificant in what is again projected to be the weakest position in the major leagues. Major-league catchers combined to slash .242/.310/.391 last season with a wRC+ of 87. So if your team has a Posey, if Gary Sanchez’s second half is indicative of who he might be for 2017, then those players stake their respective teams to significant relative advantages. Only five teams — the Giants, Rangers, Yankees, Dodgers and Astros — project to earn three wins or better from the position, though it is important to remember pitch framing isn’t factored into FanGraphs’ WAR formula. There isn’t expected to be much change in relative power: the Giants, Nationals, Rangers, and Yankees comprised four of the top-six teams last year. Still, there are players like Travis d’Arnaud, Austin Hedges, and Mike Zunino who contain upside and could perhaps reach new levels of performance. As for an addition of new, young, star power, only two catchers — and Jorge Alfaro at No. 32 and Francisco Mejia at No. 37 — ranked in top 50 of Eric Longenhagen’s top 100 prospects. Mejia is not expected to contribute at the major-league level. So, let’s rank some catching depth charts, shall we? There are some whispers that Buster Posey’s best days are behind him. Yes, his isolated slugging diminished for a second consecutive season. Yes, he posted his lowest wRC+ (116) in a full season. Yes, he’s logged a lot of innings behind the plate. Yes, he’s going to turn 30 years of age on March 27. But Posey’s average exit velocity was actually up last season (91.2 mph) from 2015 (89.6), his walk rate increased, and his elite bat-to-ball skills remained in place. He ranked as the game’s best framer, according to Baseball Prospectus, and he matched a career best by throwing out 37% of base-stealers. So, Posey should be just fine in 2017. Even if we’ve already witnessed peak Posey, he stands a good chance to again be the game’s most valuable catcher. Of course, as Posey knows well, all players are susceptible to injury. And should Posey suffer a significant one, the Giants are in some trouble, as Nick Hundley rates as a poor receiver and hitter. Posey is already one of the most irreplaceable stars in the game and the Giants’ depth behind him only further enhances the importance of him being on the field. Posey’s workload increased to 1,069.2 innings behind the plate last season after seeing less time at catcher and more time at first base in 2014 and 2015. Only four players — Jonathan Lucroy, Russell Martin, Yadier Molina, and Salvador Perez — have spent more time behind the place than Posey’s 3,931.2 innings since 2013. That’s a lot of squatting. Perhaps Posey should receive more of a break in 2016 and spend some more time at first to better delay and soften the inevitable decline. There isn’t much question as to whether Jonathan Lucroy will hit. He slugged a career-best .500 last season and hit a career-high 24 home runs. He adjusted well to a new league, OPS-ing .885 in Texas after posting a .841 mark in Milwaukee. After struggling to control the run game earlier in his career, he’s posted caught-stealing marks of 39%, 40% and 36%, respectively, in three consecutive seasons. The great mystery and reason for concern with Lucroy is his framing. Lucroy inexplicably went from enjoying status as one of the game’s best receivers, able to get the low strike called as well as any catcher, to performing near a league-average rate the last two seasons. Framing is a skill that is supposed to age well, so it’s a bit of a mystery. Perhaps Lucroy struggled with an ineffective and wild Brewers staff. As with many things in baseball, there are outside variables that effect a skill we credit to individuals. The Rangers have been a below-average framing team since 2011, so a return of Lucroy to his past form would be of significant benefit — one that wouldn’t be reflected in the above WAR totals. If Lucroy’s glove returns to form, he could add another hidden win or two to the Rangers, and create further separation from the pack at the position. Yasmani Grandal might not have a bigger fan than myself. I placed Grandal seventh on my NL MVP ballot last year and I explained why in this I post. My thinking with that vote? Grandal ranks as one of the game’s elite framers trailing only Posey last season, according to the Baseball Prospectus framing metrics. (Think Zack Greinke missed Grandal last season?) Grandal also has rare power for the catcher position, posting a .249 isolated-slugging figure last season and elite 92.5 mph average exit velocity (topping Paul Goldschmidt), while barreling 13.9% of his batted balls according to Statcast data. He also has one of the best batting eyes and walk rates and the game. Oh, he’s a also switch-hitter. Grandal is something akin to Carlos Santana, the baseball player, if Santana were an elite defensive catcher. The Grandal-for-Matt Kemp heist is one of the better trades executed by Dodgers president Andrew Friedman. Of course, depth is important here: Grandal has dealt with an assortment of injuries and issues throughout his career, though he has reached at least 426 plate appearances in three consecutive seasons. The Dodgers do have an interesting No. 2 catcher in Austin Barnes, who has been a KATOH top-100 prospect before, demonstrated plate discipline and bat-to-ball skills, and (in a small sample) has recorded adequate framing numbers. Barnes is also a good athlete, having played some second base and third base for the Dodgers. If you believe in Grandal as I do, then he and the Dodgers are a threat to dethrone the Giants as the top catching team in the NL. OK, now things get interesting. The Yankees could end 2017 having enjoyed the most catching production in the majors if you believe in Gary Sanchez’s second half. They could have something considerably less, if Sanchez can’t match the hype surrounding him this season. The question seems to be, how much do you believe in Sanchez’s August of 2016? As I wrote earlier this month, PECOTA’s 70th percentile outlook has Sanchez recording 33 homers, a .504 slugging mark, and 4.8 wins this coming season. At our Web site, the Fans’ average crowdsourced projection for Sanchez is a .274/.343/.482 slash line with 5.2 WAR. The Fans believe, in other words, that Sanchez and Bryce Harper are going to be players of similar value this season. There’s no doubt Sanchez has some very loud tools — perhaps 70-grade power and arm strength — but there’s more uncertainty as to how the league will adjust, and if those tools will more consistently play than they did in the minor leagues. While it’s true Sanchez played in some pitcher-favorable leagues in the minors, his 2016 Triple-A slash line .282/.339/.468 (and 10 homers in 313 plate appearances) nearly matched the slash line of his seven-year minor-league career: .275/.339/.460. If the real Sanchez is nearer what we saw in the second half, then the Yankees might enjoy the top catching production in 2017, though Sanchez’s middling framing numbers might not allow him to wear that crown by all measures. If Sanchez hits some growing pains in 2017, then the Yankees will rank further down the leaderboard. The Yankees have eroded some depth by trading Brian McCann. Austin Romine is slotted as the top reserve and a player who would be challenged in anything but a limited role. But all the focus is on what Sanchez might be. According to our FanGraphs projections, he’s quickly headed toward stardom. The Houston Astros will enjoy a rare sort of catching platoon in 2017 with two catchers — the returning Evan Gattis plus Brian McCann, acquired via trade from the Yankees in November — who provide power and above-average offensive production for the position. McCann and Gattis are similar hitters. They have identical 113 wRC+ marks for their careers. For his carer, McCann has a 117 wRC+ mark against right-handed pitching, Gattis has a 116 mark against lefties. Assuming they each remain healthy, the Astros should cobble together some of the best run production from the catching position in the majors. As Eric Huysman of Climbing Tal’s Hill has noted, the pair could threaten to combine to become the most valuable catching group in franchise history, needing to top Joe Ferguson and Milt May’s combined 4.7 WAR set back in 1977. McCann is the superior receiver, though Gattis ranks as above average. In what figures to be an interesting AL West race and crowded AL Wild Card race, the Houston catching platoon should serve the club well. If we were ranking catchers in tiers, there would be a drop-off at this point. Vogt earned an All-Star bid last summer. After an impressive .762 first-half slash line, however, he slumped to a .652 OPS in the second. While he’s one of the better offensive catchers in the game, producing wRC+s marks of 115, 116 and 93 the last three seasons, while he reduced his K-rate from 19.0% to 15.6% last year, while he’s an extreme fly-ball hitter (0.73 GB/FB) — which is a really good thing if you’re on the fly-ball bandwagon — Vogt comes with some significant negatives. For starter, he’s a poor receiver and his caught-stealing rate fell from 32% in 2015 to 28%, or below league average (29%). Vogt is also entering his age-32 season. So his best baseball may very well be behind him. The 26-year-old Bruce Maxwell could be the future at the position for the A’s. He was the club’s second-round pick in 2012. A left-handed hitter who routinely posted double-digit walk rates in the minors, Maxwell was rated as an above-average framer and defender in his small sample of major-league work in 2016. Whether he can beat out veteran Josh Phegley is unclear, and with Vogt also being a left-handed hitter, there’s not a clear platoon role for Maxwell in 2017. Perhaps here’s all you need to know about the all-around quality and importance of Russell Martin: he’s been the starting catcher for a playoff team in seven straight years — and for three different teams (the Yankees, Pirates and Blue Jays, in that order). If you extend it out to 10 years, Martin has advanced to catch in nine postseasons. If you extend it to 13 years, Martin has made 11 postseason trips with four different clubs. While some are leery of the term “winner” in the sabermetric community, Martin make a pretty strong case for deserving the label. He’s competitive, a tireless worker, and he has the respect of teammates. When Martin began wearing the Zephyr Bionharness in 2014 in Pittsburgh, a wearable technology that monitors workload, a number of his teammates adopted the practice. He’s also simply a really good player one of the few catchers in the game to contribute on both sides of the ball. As a co-star of “Big Data Baseball” he will always occupy a place in my heart. But the the days of Martin as an above-average catcher are probably nearing a close. He’ll be entering his age-34 season and the third year of a lucrative five-year deal. Martin threw out a career-low 15% of base-stealers last season a year after posting a career-best mark of 44%. His 1.9 WAR was his lowest seasonal total since to 2009. His wRC+ fell to 99. While Martin was hampered by a knee injury last summer, aging curves are also cruel realities. Still, the Blue Jays need Martin healthy. Jarrod Saltalamacchia is the favorite to back up Martin and is coming off a dreadful year in Detroit during which he hit .171 with a 69 wRC+ and 36% strikeout rate. He has also been a poor receiver throughout his career. Even a Martin in decline is much preferable to the in-house alternatives, and a Martin in decline is still among the more valuable catchers in the game. While there has been so much attention on Gary Sanchez in real baseball and fantasy circles this offseason, the NL had its own impressive rookie catcher in Contreras, who slashed .282/.357/.488 with a 126 wRC+ in half a season with the world champs. He caught 37% of base-stealers — league average was 27% — and also showed athleticism by logging 180.2 innings in left field. Let’s see Sanchez do that, folks. Contreras was also rated as slightly above-average framer last season while Sanchez was slightly below average. So it seems Contreras is underappreciated at the moment because of Sanchez and because of the wealth of young positional player talent the Cubs enjoy. The Cubs could also have one of the better backup catchers in baseball in Miguel Montero, whose solid batting eye and receiving skill remained intact. In fact, Montero rated as the No. 1 framer per game last season among catchers who received at least 100 pitches. The Cubs rank eighth here, but if Contreras’s 2016 was for real, then we could be under-selling the Cubs. The Cubs are seemingly great everywhere and that might also now include the catching position. Even the knee-injury scare Salvador Perez suffered in World Baseball Classic play is unlikely to prevent Royals manager Ned Yost from again burdening Perez with too many innings. Poor Salvy needs a rest. Perez leads baseball in innings caught since 2013 (4,662) and by a wide margin. Since 2013, he’s logged 17% more innings at catcher than the No. 5-ranking catcher, Buster Posey, and 13.7% more inning than the third-ranking catcher, Jonathan Lucroy. And the workload is apparently having a real, negative effect: over the course of his careeer, Perez has recorded a .282/.312/.456 slash line in the first half of seasons and a .263/.293/.410 line in the second. In an era where teams are supposed to be more interested in player efficiency and rest, the Royals keep treating Perez as if he’s playing first base. Part of the issue is that Perez has been backed up by poor reserve options. That will continue in 2017, as Drew Butera and his .198/.253/.295 slash line is again in place to back up Perez. Perez is an overrated player, a poor receiver with a so-so bat and a strong throwing arm. His value is perhaps inflated in these rankings because receiving isn’t accounted for. Now, if we extrapolated his first-half performance over an entire season, no one would be describing Perez as ove-rated. But for that to happen, the Royals would have to be willing to give Perez a rest, which they’ve been unwilling to do to date. You could argue no player is more responsible for the Cardinals’ sustained run of relevance, and often excellence, than Yadier Molina. Since becoming the starter in 2005, Molina has produced 47.2 bWARP, Baseball Prospectus’s win model that includes catcher framing. Molina will turn 35 in July, but he showed few signs of slowing down in 2016. After an injury-blighted 2015, Molina hit .307 with a .360 on-base mark and 113 wRC+ last year. His walk and strikeout rates were in line with his career averages, as well. An area in which Molina did decline was in controlling the running game, as his caught-stealing rate of 21% is half that of his career average and a significant drop from his 41% mark from 2015. Of course, pitchers are perhaps most responsible for the success of base-stealers, and Molina’s arm appeared just fine in the World Baseball Classic. Molina cannot seemingly go on forever, he’s human, but he seems a good bet to remain one of the better catchers in baseball in 2017. If age or injury should catch up to Molina in 2017, veteran Eric Fryer will likely open as the top reserve. That said, 22-year-old Carson Kelly was in big-league camp fighting for a roster spot after posting a .292/.352/.381 in Triple-A last season. While Molina is still the present, Kelly, ranked as FanGraphs’ 81st-overall prospect, appears to be the future. Longenhagen describes Kelly as “a rock-solid defensive catcher with limited but inoffensive offensive ability.” That line could have once described a 22-year-old Molina. The Mariners have the potential to beat this preseason ranking due to Mike Zunino’s significant improvements in process at the plate in 2016. After swinging at everything early in his major-league career, Zunino boosted his walk rate and swung at fewer pitches out of the zone during is time in Tacoma last season. What is encouraging for the Mariners and Zunino is he kept those gains after he was recalled in July, posting a 10% walk rate and reducing his O-swing rate from 34% in 2015 to 27% last season. Moreover, Zunino has become an even more extreme fly-ball hitter, and if you’ve been reading FanGraphs in 2017 you know fly balls are generally preferable to ground balls. If Zunino’s new offensive baseline is the 115 wRC+ he posted last season, and you factor in his receiving skills, then the Mariners could have one of the better, younger catchers in the game. The Mariners also have quality veteran depth in Carlos Ruiz who posted 1.5 WAR last season in 62 games, and who still provides league-average offense for the position along with his leadership intangibles and defensive chops. The catching position could be a strength for the Mariners in 2017. If there was third tier to the these rankings, I suspect it would begin here. The 25-year-old J.T. Realmuto has a skill that few professional catchers own: he can run. He stole 12 bases for the Marlins last season and recorded the most infield hits (22) among major-league catchers, suggesting that some of his .357 BABIP (and career .323 BABIP) is sustainable. His contact skills and foot speed helped him to a .303/.343/.428 slash line last season. While most hitters would benefit from producing more fly balls, Realmuto’s ground-based profile plays well in light of his speed. He posted a 1.62 GB/FB ratio last year and has a 1.48 GB/FB ratio for his career. That said, out of 104 qualified framers last season ranked by Baseball Prospectus, Realmuto placed 101st, with -15.7 runs saved by that measure. While Realmuto provides some run-scoring skills, while his throwing accuracy has improved, his glove is hurting a Marlins pitching rotation that needs more help behind the plate. The Marlins have never valued framing much. They previously employed Jarrod Saltalamacchia, and Realmuto’s backup, A.J. Ellis, is another poor receiver. When Francisco Cervelli is on the field, he’s a productive player. He’s one of the game’s better framers, he owns a .361 career on-base mark, and he reached base at a .377 clip last season. While a broken hamate bone further sapped his already middling power last season — his slugging was 55 points below his on-base mark — he’s a rare catcher who contributes on both sides of the ball. The problem is, Cervelli’s almost always dealing with an injury. Prior to arriving to Pittsburgh, Cervelli missed 199 games to injury from 2011 to -14 with the Yankees. After a healthy 2015 campaign, which he parlayed into a three-year, $31 million extension, he was limited to 101 games last season. Cervelli is best paired with a quality reserve, but the 35-year-old Chris Stewart’s value is limited to receiving and he has missed much of last season due to a knee injury that require surgery. The Pirates do have a strong-armed, young catcher in Elias Diaz, who saw some time in September last season, and could push Stewart to become the primary reserve going forward. Still, for the Pirates to return to the postseason, they will likely need a healthy Cervelli. The Tigers project to have a starting catcher in McCann who offers little production on one side of the ball. James McCann exchanged contact skills for power last season, but it was poor trade-off: his strikeout percentage grew by eight points and his isolated power made only modest gains, from .122 to .137. On the season, he produced a lowly 66 wRC+. On the plus side, FanGraphs defensive metrics rate McCann as quality defender. McCann told FanGraphs’ David Laurila that he focused on his framing technique last season. Evidence suggests that framing can be an acquired skill, and McCann improved from ranking as a below-average framer as a minor leaguer to slightly above-average one last season. He and the Tigers’ pitching staff controlled the running game at an above-average rate (30% caught stealing). Former starter Alex Avila is expected to back up McCann after signing a one-year deal. As noted by colleague Alex Chamberlain, Avila finished runner-up to Miguel Sano in the competition to become baseball’s Three True Outcome King, posting an 18% walk rate while his strikeout rate increased to a troubling 37%, 10 points above his career average. Who knows, maybe Jonathan Lucroy would be wearing a world championship ring had he not rejected a trade to Cleveland at last year’s trade deadline. Lucroy opens 2017 as the unquestioned starter in Texas, something he claimed he was not promised in Cleveland, which he said was a deal-breaker. FanGraphs projects him to be the most valuable catcher in the AL. If Lucroy had accepted a trade last deadline, the Indians would rank much higher on this list. Instead, they are in the middle of the pack and could have a catching controversy on their hands. Yan Gomes will reportedly retain his job to open the season despite his offensive collapse last season (33 wRC+). Roberto Perez will serve as the primary reserve after collecting some timely hits in the postseason and throwing out 13-of-26 would-be base-stealers in the regular season. Perez could push Gomes, as Gomes’ framing, once a strength, has declined three straight years and has ranked below average in each of the last two seasons. If you extrapolate Perez’s 2016 framing over a full season of work, he’d rank as the game’s No. 4 pitch framer last season, according to Baseball Prospectus. The Indians are perhaps the first team on this list where a real scenario exists in which the projected starter is usurped for non-injury reasons. Still, maybe the Indians are OK with the Lucroy veto. The club ended up keeping Francisco Mejia, who has emerged as one of the top catching prospects in the game, ranking behind only Jorge Alfaro according to FanGraphs’ Eric Longenhagen. While Mejia will not factor into the Indians’ 2017 plans, he’s a switch-hitting catcher with a plus hit tool and strong arm. The veto meant the Indians lost short-term value at catcher, but Mejia could be a rare, two-way impact catcher for years to come. The Red Sox and Indians enter the season as the top two teams in the in AL in FanGraphs’ projections, but each sit in the middle of these rankings, with catching situations that house a considerable amount of uncertainty. After showing little power over parts of three seasons in the majors, Sandy Leon came out of nowhere to slash .310/.369/.476 and post 2.5 WAR in 76 games. However, the league might have caught up: Leon slashed just .213/.286/.253 in September. Red Sox manager John Farrell told reporters this spring it remains to be seen if Leon’s 2016 was an outlier or a new baseline expectation with the bat. In terms of possible alternatives, Christian Vazquez and Blake Swihart are still around. Vazquez is two years younger, at 26, and he’s a superior receiver and defender. But he has just a 61 wRC+ across parts of two major-league seasons. The switch-hitting Swihart has the most prospect pedigree and offensive upside; he’s a switch-hitter who has displayed discipline and bat-to-ball skills. He’s also had an excellent spring. But Swihart has minor-league options remaining unlike Leon and Vazquez. Swihart also dealt with some throwing issues early this season. The Red Sox have a muddled situation, but there is upside here, especially if the Swihart’s glove can match his bat. The page has officially turned at catcher in Baltimore, where the Orioles let Matt Wieters walk away without much of a fight and replaced him with Welington Castillo on a one-year, $6 million deal. While the presence of Castillo helps place the Orioles in the middle of the pack in these rankings, he’s a good bet to produce surplus value for the club in 2017. Castillo has roughly averaged two wins per year over the last four seasons of his career. While Chase Field is more home-run favorable than Camden Yards, it’s not as if Baltimore is pitcher-friendly, and the AL East road venues are of course more favorable than those in the NL West. Castillo is not a star in any one area, but he won’t kill a club behind the plate. Reserve catcher Caleb Joseph is a solid defender coming of a brutal offensive season, when he produced a 6 wRC+. Yes: 6! The Orioles do have help on the way: catching prospect Chance Sisco ranks as the No. 1 prospect in the system and 85th in baseball according to Eric Longenhagen. If his defense continues to catch up to his advanced hit tool, Sisco could arrive next year, and he might be arriving just in time. We’ve reached the upside-coupled-with-uncertainty portion of the rankings. If Travis d’Arnaud could stay healthy for a full season, the Mets might have a star on their hands, and the club could rank much higher in the 2018 version of these rankings. d’Arnaud’s shoulder issue seemed to sap his hitting strength. Consider this, from The Hardball Times annual: “In 2015 45% of his balls in play were pulled fly balls, which had an average exit velocity of 92.5 mph and a slugging of 1.500. In 2016 this dropped to 36%, and their average exit velocity dropped to 87.7 mph with a slugging of .920.” If d’Arnaud is healthy, and can stay healthy, he could be one of the best catchers in the game. He’s an able receiver who’s already demonstrated his offensive upside, having slashed .268/.340/.485 and posted a 2.3 WAR over 67 games in 2015. But because of d’Arnaud’s health history, the depth behind him becomes important. Rene Rivera will be No. 2 on the depth chart, though the veteran is a glove-only player. The Padres rank here because Austin Hedges has never been able to hit much as a professional, posting a .161/.206/.236 slash line in his brief sample of major-league work. But a funny thing happened last season in El Paso: Hedges might have learned how to hit. Over 82 games in Triple-A, he hit 21 homers and slashed .326/.353/.597, numbers he has never come close to approaching as he rose through the minor leagues with a reputation as a glove-first catcher. Hedges spoke about changing his launch position last spring, and as Jeff Sullivan wrote last month, it apparently worked. If Hedges can translate that performance to the majors, the Padres will really have something: a defensive stalwart behind the plate who can also mash. Hedges could become an important cog of the next relevant Padres team. The Padres have a chance to finish well above this ranking. The Nationals’ cozy relationship with Scott Boras perhaps hurt their ranking here. With Matt Wieters still looking for work in late February, with the Nationals not seemingly in need of his services, Washing nevertheless became (yet again) a home for a Boras client. At least nine of the projected 25 players on the Nationals’ Opening Day roster will be Boras clients. The Wieters signing was a curious fit. His bat has never developed as hoped: he posted a 88 wRC+ last season and has a 97 mark of this career. And while he is renowned for his intangibles and throwing arm, he struggled to find work due this offseason ostensibly due to his issues as a receiver. The Nationals jettisoned Derek Norris — releasing him on March 15 — parting ways with a similar offensive performer to Wieters, and a clearly superior framer. Norris recorded 4.2 bWARP over the last two seasons, while Wieters combined to produce 1.8. FanGraphs projects them to produce similar per-inning value in 2017. So it seems the Nationals paid extra dollars for similar production, or perhaps to become worse. After enjoying a 3.5-win season from Wilson Ramos last season, the Nationals could suffer significant drop-off at the position in what could be a tightly contested race for an NL East crown. Back in 2015, after a 4.5-win breakout season from Devin Mesoraco, the Reds and their then-young, star catcher agreed to a four-year, $28-million extension. In 2015, the Reds ranked 10th at catcher in this preseason list. Everyone was happy. Then 2015 and 2016 happened, hip and shoulder injuries limiting Mesoraco to 106 plate appearances. What had become a strength for the club was rendered a weakness. At the moment, Mesoraco is healthy, but we don’t know what kind of player he’ll be. The Reds need him to be good — if for no other reason that to enhance his value and make life a little easier for young promising arms like Brandon Finnegan. While Mesoraco is thought to be just an average receiver, the Reds catchers combined to rank as the second-worst framing duo in the majors last season, according to Baseball Prospectus. Chris Okey, the club’s second-round draft pick from last season, had a promising debut and ranks as the organization’s No. 8 prospect, according to Eric Longenhagen’s organizational rankings, but the Reds might need to find a bridge to Okey if Mesoraco continues to struggle to stay on the field. The Twins are one of the last remaining clubs to jump on the pitch-framing bandwagon, but they have jumped on, signing Jason Castro to a three-year deal this offseason. The club ranked 25th in framing last season as a team (-16.3 framing runs) and 22nd in 2015 (-13.5), according to Baseball Prospectus. Castro should help the club improve upon those marks, even if his total value isn’t completely accounted for in this WAR forecast. Castro was one of the better framers in the game for the Astros, and his glove should be welcomed by the Twins staff. While Castro won’t hit his way into the middle of a lineup, he’s a believer in the fly-ball approach. J.D. Martinez’s breakout is tied to working with Castro’s personal swing instructor, and Castro also possesses a sound batting eye. 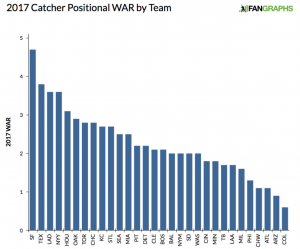 Over the last three years, the Twins rank 28th in baseball in WAR produced by catchers (2.7). While Castro isn’t a star, he’s a step in the right direction for a club that’s been slow to adopt new ideas. Tampa Bay is always in search of opportunity, and they reached a two-year, $12.5 million deal in the offseason with Wilson Ramos. It’s unclear when Ramos will be ready to catch after tearing his ACL on September 27, but when he does — and if he can return to his 3.5-win (and 5.2 bWARP) form — the Rays will have made a winning bet. Ramos said he hopes to return in May, but the club is unlikely to rush him back. It’s unclear how much time he’ll spend at catcher in 2017. Until he returns, Tampa Bay has a muddled playing-time situation with uninspired options Luke Maile and Curt Casali competing for time this spring. Derek Norris is reportedly of interest and would seem to be a logical fit. The Rays could take a step forward at catcher in 2018 with a fully healthy Ramos, but they could be in need of superior short-term stopgap in 2017. At catcher, like at many other places on their roster, the question is whether the Angels have done enough to surround Mike Trout. Martin Maldonado, the former backup to Jonathan Lucroy in Milwaukee, is a solid defender, rating as an average framer and owner of a 35% caught-stealing rate for his career. With the bat, he owns a modest career 71 wRC+ but enjoyed a significant uptick in walk rate last season, jumping four points to 13.5%. If he can repeat his .332 on-base mark, he could provide the Angels with value on his one-year, $1.7 million deal. Maldonado seems like the favorite to receive the lion’s share of playing time thise season, though the defensive-minded Carlos Perez is also around and competing for time. Life after Jonathan Lucroy and Martin Maldonado begins with two interesting and inexperienced players in the 27-year-old Andrew Susac, who came over in the Will Smith trade, and the 26-year-old Jett Bandy. Susac demonstrated patience and power in the Giants system after being selected in the second round of the 2011 draft. He has questions to answer about his throwing arm — throwing out 25% of runners in his brief career — but he appears to be at least an average receiver with perhaps the potential to produce 10-15 homers and an average on-base mark. Bandy has three things going for him: his name, his status as an extreme fly-ball hitter to date in his brief career, and an arm that allowed him to throw out 36% of baserunners in his minor-league career. Journeyman Manny Pina is also competing for a catching role. The Brewers are in a position to give these inexperienced catchers extended looks in 2017. Cameron Rupp will begin the season as the Phillies catcher, but he has little to offer outside of some power for the position. He is, or the Phillies hope he is, something of a placeholder until Jorge Alfaro arrives. In the Phillies’ wildest dreams, Alfaro — ranked as the top catching prospect in the game according to Eric Longenhagen — becomes something of the NL’s version of Gary Sanchez. Alfaro, like Sanchez, has two very loud tools — 70-grade tools — in his throwing arm and raw power. The most glaring difference between Sanchez and Alfaro is their control of the plate on the offensive side: Alfaro has had much more trouble making contact and has shown little willingness to talk a walk. Will he be able to translate his raw power into game power? Alfaro figures to get another look later this summer, and while no one should expect him to burst on the scene like Sanchez, while it could be a rocky beginning to his career, it would be a disappointment to the organization if he does not eventually settle in as an above-average catcher. The White Sox hope that 2016 first-rounder Zack Collins is the eventual answer at catcher. He has patience and raw power. The question is whether his defense will be palatable. He’s the only catcher who appears among Longenhagen’s top-27 prospects in the organization. In 2017, the White Sox are expected to give the lion’s share of reps to Omar Narvaez, whom Longenhagen described as a “solid receiver and game-caller” but who “has a below-average arm. He popped between 2.06 and 2.09 for me this year.” Longenhagen projects him as a low-end backup, which in explains in large part why the White Sox rank near the conclusion of these rankings. Tyler Flowers returns as the Braves’ starting catcher in the second year of a two-year deal, though his contract includes a $4 million club option for 2018. For the first time in his career last season, Flowers produced a wRC+ north of 94 with (a 110 mark), production fueled by his .149 isolated power. He rated as one of the game’s best framers according to StatsCorner and Baseball Prospectus. Kurt Suzuki is also around and will see time but he’s a poor framer and has thrown out fewer than 20% of baserunners in each of the last two seasons. The Braves selected Brett Cumberland in the second round of the draft and he ranks as their top catching prospect — 19th overall in the system — but the system is thin at the position. The club will soon need to identify a longer-term solution at the position. On December 2, the Diamondbacks joined the 21st century. On December 2, the Diamondbacks announced the hire of Mike Fitzgerald to lead their analytics department. Perhaps Fitzgerald’s most notable contribution in Pittsburgh, where he was the No. 2-ranking analyst, was pounding the table for then free agent Russell Martin — and, at the same time, the power of pitch-framing — at the close of the 2012 season. On December 2, the Diamondbacks reached a two-year agreement with catcher Jeff Mathis. On a per-pitch basis, among catchers who received at least 1,000 pitches last season, Mathis was was the ninth-best framer in baseball, according to Baseball Prospectus. Mathis figures to be part of a timeshare at catcher, where he will split time with Chris Iannetta — who was signed to a one-year deal in January — and perhaps form the right-handed part of a platoon with left-handed hitting Chris Herrmann, who slashed .284/.352/.493 in 56 games last season. The addition speaks to the reality that just about every team in baseball now values framing skills. And while the relative value of framing has decreased and is in jeopardy as Jeff Sullivan discovered earlier this year, Arizona was a team that could benefit from an improvement. While it might not show up in this preseason WAR projection, Mathis’s glove and veteran leadership could improve a unit that on the surface appears to taken a step back with the loss of Welington Castillo. Speaking of framing, Jeff Sullivan noted the Rockies should have their best framing team in history as former Indians infield prospect turned framer extraordinaire, Tony Wolters, is in line to receive the lion’s share of work. Offensively, in a small sample of work, Wolters was better in the second half (recording a 109 wRC+) than the first (when he produced a 51 wRC+), but he also produced a .439 BABIP in the second half versus a .272 mark in the first. But Wolters’ value will be in large part tied to his glove, which is not completely accounted for by FanGraphs WAR. Wolters was worth 1.7 bWARP last season compared to 0.9 WAR. The projected primary backup, Tom Murphy, will likely open the season on the DL with a fractured forearm, though he should only miss several weeks. Wolters, Murphy and former Rockies catcher Nick Hundley combined to allow the Rockies to finish 17th in catching WAR last season. Perhaps the Rockies can beat this forecast, and Wolters’ glove should allow for some significant hidden value to be produced that will not be picked up by most measures of WAR. We hoped you liked reading 2017 Positional Power Rankings: Catcher by Travis Sawchik! Cubs fan here… none from me. I’m optimistic because I know the FO loves him. However, I do want to see him play. As much as I like him, I know Matt Stairs is in the range of possibilities.